Open innovation has vitalized firms' interest to tap into external innovation sources. Prominent case studies of well-known multinationals such as Procter & Gamble, Philips or IBM demonstrate that firms from different sectors have discovered the value to be gained from searching for new ideas outside of their firm's boundaries. While existing literature indicates that "openness" has become highly influential in firms' innovation strategies, it does not sufficiently explain whether and how different open styles of innovation affect a firm's innovation performance and growth. This dissertation opens the black box of different "open styles" of innovation strategies and overcomes major limitations in existing research. 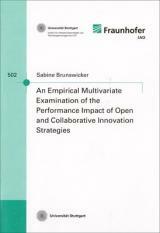 It empirically examines multivariate causal relationships between different types of open and collaborative innovation strategies and innovation-based value creation. It is the first quantitative empirical research that statistically infers these causal relationshipsand is based on 1,489 firm level data of European small and medium-sized enterprises (SMEs). A rigid quantitative observational research design and solid multivariate regression modelling allow making such causal claims which can hardly be made in case study or action research. Departing from a structured review of existing empirical research, this research introduces a theoretically grounded framework detailing multivariate causal relationships between open and collaborative innovation strategies and firm's innovation success, innovation performance and income growth. It is unique as it takes into consideration both external factors, which may constrain a firm's strategic choice, and internal factors, which may facilitate open and collaborative innovation strategies. Indeed, openness may challenge the way firms manage innovation internally. The conceptualization of five types of organizational practices and their integration as "mediators" is a differentiating factor of thedeveloped framework and its directional hypotheses. In preparation of the discussion of causal relationships this research presents an empirical exploration of six types of external search strategies revealing that SMEs engage in open and collaborative innovation. In addition, five dimensions of organizational innovation practices were statistically composed. By doing this, this dissertation makes a major step forward towards an empirically validated framework for identifying and measuring organizational practices for innovation. The empirical examination of the causal framework is the major contribution of this research. It is implemented via multiple regression models. To make proper causal claims, logit and tobit regression models take into consideration the specific nature of measures. Empirical analyses concentrating on the external perspective thoroughly examine the impact of different open styles of innovation. Results strongly suggest that open styles of innovationdo shape a firm's performance both in a positive and negative way. However, "openness" is not a dichotomic concept - open versus closed - but should be considered as multidimensional interactions with different types of innovation partners and a firm's co-development relationships. It matters how firms open up their innovation processes, with whom and how they interact when searching for new ideas and whether they engage in dense co-development partnerships. Some innovation sources positively affect a firm's innovation performance, whilst others do not. Furthermore, it makes a difference how firms involve various innovation partners simultaneously. A major implication of the examination of moderating effects is that openness goes beyond a firm's strategic choice as the industry clockspeed and the appropriability conditions confine whether firms can benefit from open styles of innovation. Empirical analyses taking an internal perspective reveal the role of internal innovationpractices and assets as "facilitators" of open and collaborative innovation. Most importantly, mediating regression analyses clarify that a firm's internal organizational practices for innovation enable a firm to realize the impact to be gained from open and collaborative innovation strategies. They represent organizational antecedents of a firm's ability to successfully search, transform and exploit external innovation inputs. To create value from openness operational proficiency in managing innovation internally is not sufficient. Strategic coordination, financial dedication towards innovation, and a culture for innovation should be successfully in place. In summary, this dissertation makes significant contributions not only in a theoretical but also a pragmatic way. Results represent managerial prescriptions and guide managerial actions to develop and implement open innovation strategies and organizational practices for innovation with a high impact on innovation performanceand firm growth. Diese Publikation können Sie über den örtlichen Buchhandel oder direkt beim Verlag bestellen.